The 11th Annual Charity Quiz jointly hosted by Thompson Smith and Puxon (TSP), Jamesons and Barclays was held on Wednesday (23rd May) at Frinton Golf Club. 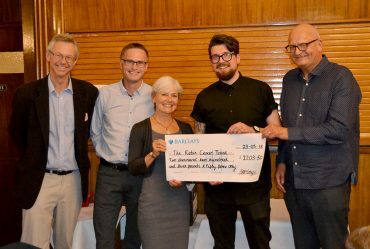 In the eleven years the quiz has been running, over £25,000 has been raised for local good causes thanks to the generosity and support of local businesses. This year the quiz was held in aid of the Robin Cancer Trust. Twenty teams representing businesses across the region took part in the quiz, with TSP Director and Employment Solicitor, Richard Porter, as Compère for the third year. After a tightly fought contest of 10 rounds the winners were TSP’s very own ‘Smart Alecs’ closely followed in second place by ‘Jamesons Boys’ – a team from the joint hosts. An enjoyable evening was had by all and the event raised a grand total of £2,203.50 including £1,000 of matched funding pledged by Barclays. TSP Senior Partner, Mary Anne Fedeyko, presented the cheque to Toby Freeman, Founder and CEO of the Robin Cancer Trust. Pictured above from left to right are: Richard Porter (TSP) Simon Cudmore (Barclays) Mary Anne Fedeyko (TSP) Toby Freeman (Robin Cancer Trust) and Alan Brown (Jamesons). The Robin Cancer Trust is the UK’s only germ cell cancer awareness charity. The charity aims to raise awareness of testicular and ovarian cancers in young adults by highlighting the importance of early detection, promoting awareness of the signs and symptoms and tackling the ’embarrassment factor’ in young men and women. The winning team ‘Smart Alecs’ pictured below from left to right are: Mary Anne Fedeyko, Marie Crawley, Laura Patterson, Stephanie Burgess, Jessica Oughton, Gemma Day and Sean Stuttaford.